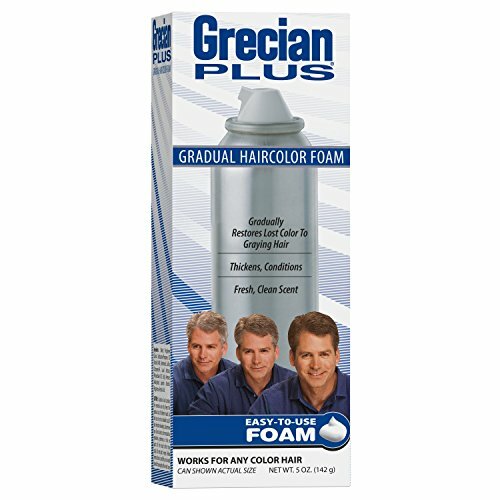 Grecian Formula Foam Hair Color with Conditioner is not a typical hair color formula. It's more of a personalized version that actually lets you replace gray hair with your natural color. Plus, you can always stop in between to keep a little gray to get an experienced look. Hair color comes from melanin, and as we age melanin production in body decreases. Grecian Formula replaces it with a similar pigment over time so you can control how much color you want in your hair. Grecian Formula Foam Hair Color with Conditioner can gradually restore your hair color but it also makes thinning hair better. It contains hair thickening agents that repair and strengthen, reducing hair loss from breakage. The result: healthier, thicker-looking hair. Read instructions before proceeding. Made in the USA. If you have any questions about this product by Grecian Plus, contact us by completing and submitting the form below. If you are looking for a specif part number, please include it with your message.